Read the foreword by Mara Soetoro-Ng President Barack Obama's mother, S. Ann Dunham, was an economic anthropologist and rural development consultant who worked in several countries including Indonesia. Dunham received her doctorate in 1992. She died in 1995, at the age of 52, before having the opportunity to revise her dissertation for publication, as she had planned. Dunham's dissertation adviser Alice G. Dewey and her fellow graduate student Nancy I. Cooper undertook the revisions at the request of Dunham's daughter, Maya Soetoro-Ng. The result is Surviving against the Odds, a book based on Dunham's research over a period of fourteen years among the rural metalworkers of Java, the island home to nearly half Indonesia's population. Surviving against the Odds reflects Dunham's commitment to helping small-scale village industries survive; her pragmatic, non-ideological approach to research and problem solving; and her impressive command of history, economic data, and development policy. Along with photographs of Dunham, the book includes many pictures taken by her in Indonesia. After Dunham married Lolo Soetoro in 1967, she and her six-year-old son, Barack Obama, moved from Hawai`i to Soetoro's home in Jakarta, where Maya Soetoro was born three years later. Barack returned to Hawai`i to attend school in 1971. Dedicated to Dunham's mother Madelyn, her adviser Alice, and "Barack and Maya, who seldom complained when their mother was in the field," Surviving against the Odds centers on the metalworking industries in the Javanese village of Kajar. Focusing attention on the small rural industries overlooked by many scholars, Dunham argued that wet-rice cultivation was not the only viable economic activity in rural Southeast Asia. Surviving against the Odds includes a preface by the editors, Alice G. Dewey and Nancy I. Cooper, and a foreword by her daughter Maya Soetoro-Ng, each of which discusses Dunham and her career. In his afterword, the anthropologist and Indonesianist Robert W. Hefner explores the content of Surviving against the Odds, its relation to anthropology when it was researched and written, and its continuing relevance today. 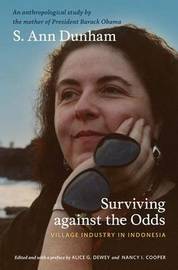 S. Ann Dunham (1942-1995), mother of President Barack Obama and Maya Soetoro-Ng, earned her undergraduate, master's, and doctoral degrees, all in anthropology, from the University of Hawai`i at Manoa. Dunham spent years working on rural development, microfinance, and women's welfare through organizations including USAID, the World Bank, the Ford Foundation, the Indonesian Federation of Labor Unions, and Bank Rakyat Indonesia. Alice G. Dewey, an Indonesianist, is Professor Emeritus of Anthropology at the University of Hawai`i. Nancy I. Cooper is Adjunct Associate Professor of Anthropology at the University of Hawai`i. Maya Soetoro-Ng has a doctorate in international comparative education from the University of Hawai`i and teaches high-school history in Honolulu. Robert W. Hefner is Professor of Anthropology and Associate Director of the Institute on Culture, Religion, and World Affairs at Boston University. He is President of the Association for Asian Studies.